I am inspired by the beauty that surrounds me and by the the ever present love of the Divine. The cocoon of unconditional love that enwrapps me, keeps me safe when challenged and strong when I am required to go beyond myself and love others unconditionally. Its from here that I create and here that exposes the beauty of the simplest living thing that touches my heart. At the Columbia Arts Festival in Maryland a few years ago a patron at my booth commented “Ahh a modern day Georgia O’Keeffe”, at the time I paid the complement little attention until I saw this quote “Color is one of the great things in the world that makes life worth living to me and as I have come to think of painting it is my efforts to create an equivalent with paint color for the world, life as I see it.” Georgia O’keeffe. “In 1924, O’Keeffe began to make paintings in various sizes, all of which focused on the centers of flowers”. That statement exemplified my work to date. Large scale art tipifies my paintings, the scale allows me the space to truly explore the awe inspiring form and color that flowers represent and using abstraction and exageration of form. The combination says stop, pause a while soak in the healing of nature and breathe. These new paintings are my outpouring of the beauty that I experience daily. Flowers stur the heart, they say all is well with the world and draw me in with their vibrant colour and their juxtaposition of shape on form. Many art lovers find hints of sexual inuendo in my painting yet the intention is to capture a feeling and with that comes every human emotion including sexuality. New beginnings with an old friend. Changes in my life encouraged me recapture the serenity that painting nature represents. 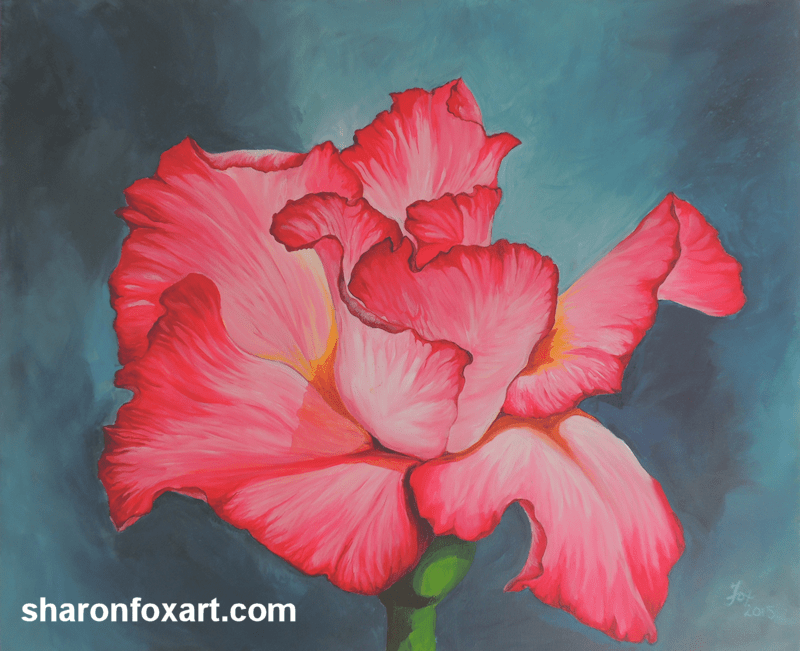 Follow my web blog at www.sharonfoxart.com collect my print series and make enquiries about the originals. Follow posts about my upcoming shows and personal appearances.